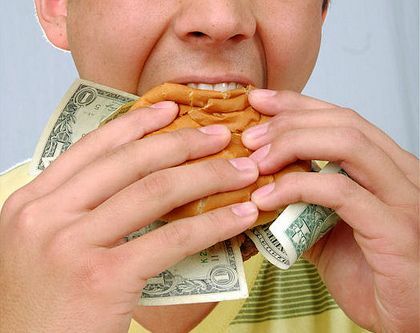 One of the biggest criticisms of ‘healthy food” is that it costs too much. So, if you are perpetually broke (or feel like you are), then eating healthy can seem like an impossible challenge. But, yes, it is possible to eat healthy on a budget. Here are some tips on how to make it possible. Chances are the reason your grocery bill is so high is because a lot of that food ends up in the trash. According to one scary report by the National Resources Defense Council, the average American family of four throws out 25% of the food and beverages they buy! This adds up to $1,365-$2,275 per year! In the UK, the situation is only mildly better. According to WRAP, 19% of all food and drink brought into UK homes is thrown away. Make a meal plan for the week and shop by it. Put fresh fruits and veggies in the freezer if you don’t think you can eat them before they will go bad. Just chop them up first and they will be easy to thaw. Freeze leftover foods for another day. Save veggie scraps (like carrot tops) and old veggies in a bag in the freezer. When the bag gets full, cook all the scraps in a big pot of water. Ta-da! You’ve got yummy veggie stock. Learn how to store your food better. For example, did you know that mushrooms will last a heck of a lot longer in a brown paper bag than in a plastic one? If you know how to cook, then you know recipes are for inspiration only – you don’t have to follow the recipe to the T. So, if a recipe calls for something expensive, find a way to use something cheaper instead. Likewise, if a recipe calls for something unhealthy, you can also usually find a good substitute. Butter (in baked goods): Use unsweetened applesauce for half of the butter. Or, you can use mashed banana in a 1:1 ratio, though it will make the dish sweeter and fruitier. Sugar (in baked goods): For each cup of sugar, you can use a cup of applesauce instead. Just be sure to reduce the liquid by ¼ cup. Heavy Cream: Use coconut milk instead. It is cheap at Asian supermarkets. When you can buy a box of pasta for just $1.20, it may seem hard on your budget to pay the $4.49 for the whole-grain version. But, opting for the healthier carbs will really pay off in terms of nutrition. Typical carbs (like white pasta, white bread, and white rice) are refined to the point where they contain little of their natural vitamins, minerals, and fiber. They make your blood sugar levels quickly soar and then crash, causing you to gain weight and feel hungry again quickly. Don’t forget that there are a lot of veggies which you can use in place of your standard starches. For example, you can forgo spaghetti completely in favor of a tasty spaghetti squash. This one should be obvious. If you buy food in bulk, then you can usually get a much better deal. But I am not talking about buying those super-sized bottles of ketchup and giant jars of jelly that you find at Costco. Even if can find healthy foods in super-sized packaging, it will probably go bad before you can eat it – which means you wasted more than you saved by buying in bulk. Only buy non-perishable items which you use frequently in bulk. So, items like whole-grain flour, pasta, beans, lentils, and brown rice are good choices. Be cautious about buying things like nuts in bulk because, yes, they do go bad. Tip: Be sure you store your bulk foods properly, such as putting grains and cereals in air-tight containers (I use glass jars which I save from pickles and pasta sauce). This will help keep them fresh longer and also keep bugs from getting into them. According to the 2012 US Bureau of Labor Statistics’ Consumer Expenditure Survey, Americans spend 40% of their food budget outside of the home. If you are choosing to eat “healthy” fast food options (which usually aren’t really that healthy), then you are probably spending even more than this. Pack a lunch for work instead. Reserve dining out for special occasions. Have a picnic for your date night instead of going to a restaurant. You get the idea. Stop eating out if you are on a budget. In summer, it is fairly easy to keep your food budget down because fresh fruits and veggies are cheaper. By wintertime though, prices skyrocket to the point where you have no choice but to shell out $5 for a tomato or eat unhealthy crap. As someone who is perpetually broke, I know the value of planning for winter while food is still cheap. I use my dehydrator to dry out fruits and veggies (peppers and tomatoes are especially great when dehydrated). I also stock my freezer full of seasonal produce to eat once the weather gets cool. And then there is pickling. Not only is pickling a great way to produce food, but there are many health benefits of fermentation, like providing you with vitamin K2 which your body needs for healthy bones. Snacking is usually the place where a lot of us go wrong – both in terms of budget and health. Part of the reason is because snack foods seem like they are cheap because they come in small portions. But, when you calculate the real per-pound cost of the snack, it is usually astronomical. For example, on a per-pound basis, one of those Apple Pie Lara Bars costs $16.85! You could buy a whole pound of walnuts (the most expensive ingredient in the snack) for nearly half the price. Of course, you can buy other snacks for much cheaper, but they probably aren’t going to be healthy. You’d be better off eating nothing than Hostess Chocolate Pudding Pie (a 4.5oz package = 520 calories and 24g of fat!). Along with a meal plan, make sure your grocery list also has a snack plan. This will keep you from impulsively buying snacks on the go. Fruit, bulk nuts, veggie sticks, popcorn, and whole-grain pretzels are all quick, cheap, and healthy snack ideas.